Founded in 1897, San Diego State University (SDSU) has grown to become a leading public research university. With more than 35,000 students, including approximately 15 percent who live on campus, the university is dedicated to promoting hand hygiene across its residence halls to improve student health and reduce class absenteeism. SDSU was using a commercial foaming hand cleanser and counter-mounted soap dispensers, but wanted a more effective and economical product for its 600 bathrooms to improve student health. In 2016, SDSU replaced its hand wash products with Deb Group’s Refresh Azure FOAM soap and its CTF Ultra counter-mounted dispensers. 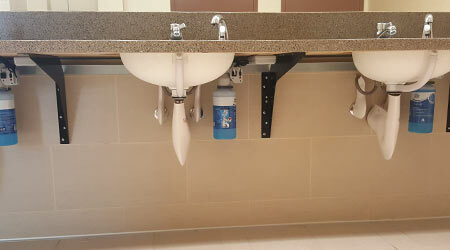 The new products were placed in all of the resident and staff public restrooms in its four residence halls. Offering a product that students and staff like to use, with a thick foam and pleasant fragrance, increased its effectiveness in infection prevention. Each hygienically sealed bottles feature a new pump and delivery tube to keep soap fresh and eliminate risks of cross-contamination. Refresh Azure FOAM soap also contains glycerin, a skin moisturizer to help improve skin hydration and prevent drying, leaving the skin feeling smooth and firm after use. “We also like the new system over the former bulk fill dispensers because it saves on maintenance. Our custodial staff can load a new bottle in seconds and the built-in indicators notify them when refills or batteries need replacement,” said Mann. SDSU’s previous dispenser was dispensing two shots at a time, resulting in an increase usage and cost. Because the Deb CTF Ultra dispenser operates properly and only the right amount of soap in one shot, SDSU was able to realize a usage and cost savings. • Refresh Azure FOAM can save up to 45 percent on water consumption compared to lotion and liquid soap use. • Refresh Azure FOAM provides over 30 percent more hand washes compared to standard lotion soap. “Our staff and students love the new system and we are looking forward to the many ways it will help everyone stay healthy during cold and flu season as well the stressful mid-term and finals season,” added Mann.